Teachers - significant people in our children's lives. I've filled in the forms and submitted our paper work for Otis to start school next year. He'll start in February 2014, just before he turns three. Otis will start in the 3-6 class, Cycle One. For many children three is the age they enter preschool. The advantage of Montessori is that he will have the same teacher, the same classroom for the next three years. I love that continuity. Being the second child in our family Otis is already familiar with the school, the classrooms and many of the children, parents and teachers at the school. Being a part of the school's parent-toddler program means that he already has a relationship with the parent-toddler guide (pictured above). We don't have any family living nearby. We have grandparents who visit and lots of adult friends, but that one on one relationship with another adult is something very special and for our family it starts at school - with our teachers. When Caspar goes to sleep at night we mention all the people we love. 'We love Daddy, we love Nana, we love Otis' and often he mentions his teacher. She is a significant person in his life. Our children have never had a babysitter, they have never been to daycare. The first time they will be looked after by someone other than myself or my husband is at school. School is the very first place they will discover themselves as individuals outside of the family. They become a part of and form their own community. They are finding their place in the world. I love that. I'm thankful for that. Of course for every family it's different. Everyone has different interactions and community structures. For many children there will be other relationships that are dominate. I'm not quite ready to say goodbye to Otis yet and we've still got plenty of time to prepare. I know I need to mentally prepare to let him go. Right now I'm enjoying watching him form those bonds, watching him build trust in the teachers and our school community. I loving how his eyes light up when he sees some of his favourite people at school, how he smiles, giggles and runs away from his future teachers. How he already knows their names, and they know his. How very fortunate we are. A garden of his own. We only need one warm day and we are outside weeding, digging and planting. We only stopped for ice-cream, a trip to the plant nursery and school pick up. Spring is three days away and the sun is shining again. Otis has new gardening tools to break in and a butterfly garden to plant. When he returned home from school Caspar chose to plant sunflower seeds. Lots of sunflower seeds, scattered through our garden beds. To surprise his dad he said. Otis like most toddlers I believe, loves to garden. He loves to harvest his crop including carrots and strawberries. Flowers will be a little different and this garden will be a little different. It's a garden of his own. I don't think it matters if it's a big old pot outside (this is a recycled wine barrel) or a small pot plant in an apartment - the principle is the same. It's about care, responsibility, ownership. Teaching, supporting the child to care, how to care for the environment, how to care for a plant. He will learn that he is capable. He will also feel pride, satisfaction and hopefully pleasure. Otis selects the seeds, plants and waters (and over waters). The seeds will grow, he will admire, pick and arrange the flowers. I'm also hoping there will be some butterflies. By simply doing it himself he is learning. Such a very simple hands on experience. But even one pot with one plant is better than nothing where there is no garden. A large clay pot can actually serve as a great ever-changing seasonal garden for the family, and is just the right size for the child to participate in gardening in the early years. - Susan Mayclin Stephenson, The Joyful Child. Everyone can make a difference in young children's lives if they have the knowledge of the simple things needed. - Judi Orion in The Joyful Child by Susan Mayclin Stephenson. School uniforms? Yes or No? When I first started reading about this it stirred up some emotion in me. The feelings of a child being forced to wear the same clothes everyday. The child whose parents couldn't afford the uniform, the mum who forgot to wash the right uniform, the child not wearing the right shirt/pants/socks/shoes/hairband. Feelings of inequity - the cost of uniforms, the strict regulations. It feels like we all want to protect our children from unfair treatment because of the clothes they wear but there clearly isn't a winner. Without a doubt the best way to protect our children is to teach them how to respect others. At a fully functional, peaceful Montessori school (actually any school, Montessori or otherwise) children should be educated so there is no discrimination or unfair treatment based on clothes or economic factors. Can this be a reality? Yes! So are uniforms Montessori? Or not? There are some Montessori schools that have compulsory uniforms and there are others who don't. Do we teach children independence by allowing them to choose their own clothes or do we teach them they are at 'work' by wearing a uniform? Do we even out inequities by enforcing a strict adherence to school uniform policies or do we make the inequities even more evident? Do we teach children to conform or to stand out from the crowd? How do we teach autonomy? Should we be able to identify our children as part of a group by the clothes they wear? That's a little elitist isn't it? Many parents say uniforms make clothes shopping and dressing easy, but is it the easy way out? What is the Montessori way? I personally like the middle ground. The optional uniform. The gender neutral polo shirt with the matching hat. The clothes children can wear when they feel like they need to be a part of the team, but there are no consequences if you don't! When there is a class of about one fifth of the children wear the uniform on any given day - no child stands out. Perhaps I'm a non conformist but I feel like it would be difficult to send my children to a school with a strict uniform policy. Eek, I even think it's a little anti-Montessori. Learning is all around us. Home activities at five. Caspar is five. After reading and learning about a child in the second plane of development I can tell that he is not there yet. It feels like he's transitioning. After being asked about what activities Caspar does at home, it was very easy to write a post about it. As many of you know Caspar goes to a Montessori school. After school he generally likes to be by himself. I think this is his way of dre-stressing or 'coming down' from school. He likes to play with cars, run around the house and loves jumping on beds and rolling around. But after this what does he like to do? Science: Above, these aren't just carrot tops this is regenerative growth. Caspar has always loved science experiments. Most of them are made up (mixing coloured water with chalk and soap) but he often uses science experiment books and those with pictorial experiments are very useful. Although he's almost past the stage now he went through a period of observing the weather and moon phases and taking measurements such as rain and temperature. Occasionally he will keep a journal on his observations but this usually only lasts a day or two. Research: Caspar has been interested in this for a while. Often it's copy work where he will simply copy the words from a research book and draw some pictures. Sometimes he will take a topic further (such as making a model or adding photographs) but often it's one topic per sheet of paper and then filed. Sometimes it requires a trip to the library and on occasion a field trip. Art: Caspar likes to experiment but tires of any one medium quickly. Most of his creating still comes from his making box which usually develops into large box building activities. Most recently he used a hot glue gun independently which added a new dimension to his collages. Clay, paint and markers are all used regularly. Building: In addition to creating box structures from his making box Caspar will build. If it's with blocks he will only build with these large blocks, always adding new elements and props such as cars, road signs, people or just sticks. Care of the Environment: Caspar is responsible for caring for our pet Hermit Crabs. While this requires him to be responsible for their basic welfare (cleanliness, water, food) it gives him the perspective of being responsible for another living being and being able to support the life of that being. Care of Self: Caspar can very much shower, dress and feed himself (sometimes make his bed and washes his own clothes/puts away laundry) but we have been focusing on Caspar preparing his own lunch and continuing to support me with meal preparation. It's essential that although he has lost some interest in cooking (unless it's cake or cookies) he remains empowered, skilled and recognised as a contributing member of the family at meal time and responsible for the preparation of his own lunch. At this stage it's not enough to simply allow the child to choose their own activities. If given the choice Caspar would choose screen time very often. So he has freedom within limits. We ensure he has lots of stimulation, time outdoors and mostly unstructured free time outside school. He needs to have space to move and lots of basic materials to use (recyclables, tape, sticks, blocks, books, library visits, note books). He needs some level of responsibility (think pets) the the cues to be responsible for himself. It feels like there is a lot of information about the child in the first plane of development the period of the absorbent mind - birth to six, but how about the child in the second plane - six to twelve? Caspar is entering the second plane so it's something I've been thinking about. What are the characteristics of the child in the second plane? What she (Maria Montessori) noted is the elementary children between the ages of six and twelve years become interested in their peers, not from a self centered viewpoint of younger children, but from a genuine curiosity and desire to understand on a deeper level the thoughts and activities of others. Rather than being focused primarily on a sensorial exploration of the factual world about them, they now want to devote the main thrust of their energies to getting along with others and doing things together. They are transformed from essentially "sensorial explorers" to "social explorers". - Paula Polk Lillard and Lynn Lillard Jessen, Montessori from the Start. This child nearing age six or seven is passing beyond what is know as the sensory-motor developmental stage, when movement and exploration through the senses is a basic need in all learning. Now he will gradually move to a more cerebral exploration, giving up the manipulative materials according to his personal timetable. The years form 6-12 are relatively stable, and the main academic work can be done now. However it is important that the child continues to use his body as well as his mind, to get exercise, to begin to learn about and take responsibility for nutrition and health, and to continue practical work such as cooking, gardening, working with tools. At six, there is a great transformation in the child, like a new birth. The child wants to explore society and the world, to learn what is right and wrong, to think about meaningful roles in society. He wants to know how everything came to be, the history of the universe, the world, humans and why people behave the way they do. He asks the big questions and wants answers. It is the time to explore all areas of knowledge, to begin to conduct research, and to develop creative ways of processing, exploring, and expressing this knowledge. - Susan Mayclin Stephenson, Child of the World. The child is calm and happy. In a strong state of health and strength. The child's limbs elongate and the child loses their first set of teeth. The child is interested in societal groupings. The child is interested in customs and laws, they seek to have someone in control who will govern the group and obedience is paramount. Children will organise themselves into groups and establish rules. Breaking the rules leads to other children seeking justice. Games will have rules and children will feel upset if the rules are not followed. However there may be some rebellion against adult imposed rules. Intense interest in issues of good, evil, justice and injustice, loyalty and disloyalty and the rules and rituals of a group. Identifies himself as being part of a social group. The age of six is a pivotal one, recognised in many of the world's cultures as an appropriate time to ask more of children, such as beginning formal schooling. Six is the age at with Piaget speculated children advance to being able to perform mental operations (for example, imagining addition and subtraction). The child is capable of reasoning - albeit on a child's level, capable of distinguishing the real from the unreal based on his own power of reason and imagination. Montessori called it the Intellectual Period. Because of his consistent physical and mental strength, his great interest in life, and his grasp of abstract ideas, the child is an easy and pleasant companion for his parents during this period. The child needs wider boundaries for social experiences. The child has a need to go out and explore the world. Interact in a more social way with others. Can develop an intense interest in culture. The child is genuinely interested in the ideas and contributions of others. Enter a stage of no longer working side by side but working together. Likes to mix with others not merely for the sake of company but in some sort of organised activity. The child is capable of abstract and imaginative thought. The child undergoes a passage from the sensorial, material level to the abstract. Instead of asking what they start to ask why. Asking for the reason for everything. The child seeks intellectual independence. Many people feel that Montessori did not value imagination however in this plane of development she clearly held human imagination as one of our highest powers. 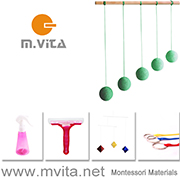 In Montessori Elementary the child beings to move back and forth from the materials to an abstract plane. The child reaches a new level of moral development, they are developing a conscience. Image from Greenspring Montessori School. This is a pretty brief recap of my readings. Please let me know if anyone has a child entering this age in Montessori as I'd love to write about Cosmic Education and what actually occurs in Montessori Elementary, if there is enough interest. Please note this post contains a product that I was given for the purpose of review. There is something really appealing about Geometric Puzzles. They are pleasing to the eye and look lovely sitting on the shelves. Often they are made of timber which is nice to touch. They are also really wholesome, a child as young as one can stack blocks while a child of five or more can create complex patterns. The child is learning through play without knowing it. As well as mathematics there are also the elements of imagination and creativity at work. Caspar hasn't used many Geometric Puzzles but has used a range of similar items such as blocks and Montessori materials like the Constructive Triangles. The Triangle Show puzzle (pictured below) comes with an information booklet and lots of diagrams of possible designs. He found many of the designs hard to follow until it came to the less abstract images of the letters and animals. The letters and animals were fun to build as piece by piece you could see the image emerge. I also took some shots of Caspar working without the guidance of the booklet. This was most interesting. Lots of fun shapes and patterns but also some discoveries (see below image - top right), I could really see his mind at work. This puzzle is suggested for children 6-12 so I know he has got a lot of thinking ahead of him, he has just touched the surface of what is possible! Thank you to Katrina from Dominna for the lovely puzzle. More information on the Triangle Show can be found here. A child turning one, very much in the first plane of development is looking for hands on, real life experiences. Toys that make sense. Toys that are natural and provide a sensory experience. 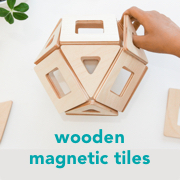 Toys that capture their imagination and help strengthen their concentration. The items that I have included in this collection are age appropriate toys and materials, however we know a child of this age will as equally if not more enjoy time spent with their friends and family, digging in the sand or dirt or enjoying the rich sensory experience of the garden. Please note that this post contains affiliate links. A child of this age may or may not be walking. While Otis at this age was happy to sit and use stacking or tracking toys many children just want to move around. Wheely Bugs and Trikes will help to satisfy this need to move especially in a prewalker. If the child is walking they may enjoy a pull along toy. If the child doesn't have a size appropriate table and chair this may be a good time to provide one. Rainbow Stacker (large version in Australia). My previous post on Ring and Cube Stackers for 12 months is here. Ball Tracker Toy. My prevoous post on tracking toys is here. First Table and Chair. There are lots of good versions of the first table and chair. Michael Olaf has an excellent option. If you are in Australia have a look at the option by Little Sparrow Infant Furniture. Books and small instruments such as a drum or rainmaker make good gifts for a child of this age too. Please feel free to add to my list. While I don't have a one year old to buy for right now I know this list will be a nice reminder in the future. When do you move them into a 'real' bed? When Caspar was young and using a floor bed, I asked around "When do you move them into a real bed"? I didn't even know anyone who had used a floor bed. Even the Montessori teachers I spoke to didn't use floor beds with their children. The general consensus was - when you and the child are ready. Well, that was difficult. With Caspar being my first child and not really knowing other children his age, I had no idea when he was ready. So just before he turned three we gave him a real bed. He was sleeping on a mattress on the floor and we simply put the mattress on a frame, the same bed frame that he uses today. Even though I feel toddler beds are super cute we skipped that phase totally. With some beds being expensive and some having long delivery/wait times it is time for us to think about a bed for Otis. He's now 28 months. He also often co-sleeps but I don't feel that interferes with his need for a new bed. While I don't feel there is a rush to get him into a bed I think it plays a part in his development. His need to be like his brother and to fit in, to feel like he is a big boy. Otis will also start school (early day only) next year and I feel this will be a big change. Getting a new bed and then going to school will all be a part of him growing up, they are significant milestones. For the next few months we will be looking at beds. It's a big decision. Beds usually stay with someone for a long time. It would be easy to get the same bed as Caspar's (which is a lovely organic Australian timber frame). Caspar wants a bunk bed however age restrictions means this isn't an option for him (for another four years!). We could get Caspar a raised bed (with storage underneath), this may satisfy his desire for height, then pass his bed to Otis. Then there are lots of other great options for single beds. I don't feel their beds (although they sleep in the same room) have to match. My advice to other parents is to move their children when they are ready and we will be aiming to have Otis settled into his new bed before he is three. Although there is no real rush, especially if the child rolls or moves a lot, gets out of bed in the middle of the night a lot or is generally really comfortable in their bed the way it is. Getting a new bed can also cause some excitement so I think it's best to do it at a time when life feels settled. Just like everything else I wouldn't make changes at a time of difficulty or stress. Out of all the beds I've seen lately this has to be my favourite. Anyone else with children transitioning to a big bed soon? We've always enjoyed matching work in our home. It started with Otis matching real items and them moving onto matching with cards. One thing I've failed to mention is that the child should already be familiar with the item before introducing the model. These birds are a great example, with the exception of the penguin we can see them all locally. Mainly we've matched fruit, vegetables, household items and animals. There are many cards available but I have on occasion photographed and made our own cards. Now Otis finds this level of matching easy but he still likes it and often chooses it from his shelves. Why? And why is it good for their brain development? It brings about deep concentration which is calming and deeply satisfying for the child. It provides an opportunity to master a skill and through repetition they can demonstrate a mastery of that skill. It allows a child to demonstrate their knowledge. Activities like this can also be lessons in vocabulary, for a child matching local birds this is also an opportunity for the child to demonstrate their knowledge in the names and sounds of the birds. It can also provide the child the opportunity to further their knowledge and then demonstrate that knowledge in a particular/specialised area of interest, for example a child learning, naming and matching dog breeds. For a child matching cards it demonstrates they are capable of making the connection between the real item, the model item and the pictorial representation. It helps a child find order in the world around them. To understand categories which also helps them to understand their place in the world. It provides an immense opportunity for the transfer of knowledge. By observing to see when the child is ready for more information, activities like this can be the instigator for further information. A child may become interested local birds which could develop into the transfer of knowledge regarding local habitats and selecting suitable plants for the garden. It provides the child the opportunity to think and reason, which may later transfer to other activities and behaviours. The child is given the opportunity to problem solve. Questioning and asking themselves with the satisfaction of finding the result - the answer. I love to watch Otis and his eyes as they flick over all the cards as he is looking for the match and then seeing the internal satisfaction of him finding and making the match. The child is using their developing memory, utilising their ability to store, organise and retrieve information, recall information in relation to something they have seen before. The first three years are a critical time for brain development. Activating neural networks = exercising the brain during a critical time of growth. Stimulate the young neurons and connections in the toddler's brain, also a way to provide sensory input. Experiences play a role in cognitive development, however the brain can only develop when the child is ready. Therefore it's important that activities like this are used during the child's sensitive period. Although Otis will often do this work alone, when this work is done with a parent or caregiver it can provide 5 to 10 minutes of together, collaborative time. I'm sure there are many more reasons why matching work is important. My previous posts on matching work include Matching Work and Cognitive Development, Matching Work, Montessori has no limits and Matching Socks.